I have no trendy NESPRESSO, NESCAFE Dolce-Gusto nor The Coffeebean and Tea Leaf expresso machines at home. 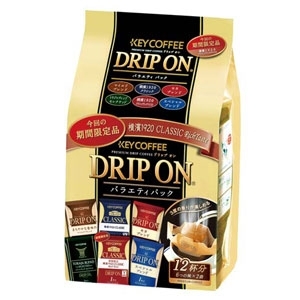 This is my equally tasty alternative - KEY COFFEE DRIP ON VARIETY PACK!! The packaging is kind of cute too! Each pack has 2 x 6 different types, of which one type is a limited edition. 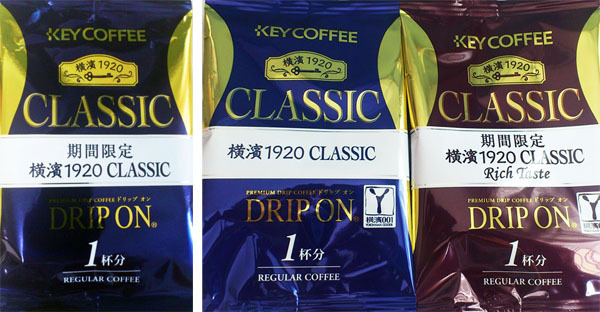 The following limited editions (Yokohama 1920 CLASSIC and Yokohama 1920 CLASSIC Rich Taste) are genius. I'm no pro so I'm unable to describe the taste, but these are just too great!! Yokohama 1920 CLASSIC was the limited edition for the last round, but looks like it's here to stay. YAY! Hence the slightly different design on its blue package!? 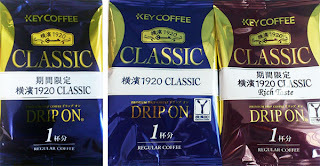 Yokohama 1920 CLASSIC and new limited edition - Yokohama 1920 CLASSIC Rich Taste.